We are the friends of Lachlan, a 17 year old Australian student and aspiring speculative fiction writer who has been struck by cancer. Lachlan is a compassionate, creative, bright young man who embraces life to the fullest. A few weeks ago, he was enjoying his first week of university, planning a 3rd anniversary surprise for his girlfriend Sarah, organising his Dungeons and Dragons mates for their bi-monthly weekend session, and starting edits on the first draft of his YA fantasy novel. Cancer has interrupted his short and long-term plans. His first two weeks of university were spent undergoing a series of medical tests and consultations. Fifteen minutes into his 3rd anniversary date, he became unwell and had to go to Emergency. He has now been diagnosed with osteosarcoma (an aggressive, painful bone cancer), and been forced to defer his university studies in order to receive the treatment he urgently needs. Lachlan’s osteosarcoma is in his right humerus. His treatment plan starts with 10 weeks of intense chemotherapy to reduce the size of his tumour and allow a limb-saving operation. He will then have surgery to remove the tumour and replace the affected bone with an endoprosthetic. After surgery, he will require another four months of intensive chemotherapy. At this stage, Lachlan has 65 overnight hospital stays already scheduled in the coming months, plus day visits and the likelihood of some unscheduled hospital stay overs. Lachlan lives with his mother, Kylie, and his younger brothers Marc and Matthew. Their limited finances have already been heavily strained by the costs of hospital trips, parking, medicines and the many extra expenses accrued during his tests and treatment to date. Kylie has drawn on her annual and long service leave to care for Lachlan, but this will run out many months before his treatment ends. While Lachlan has dealt with his diagnosis, pain and early treatments with his characteristic optimism and sense of humour, the financial and emotional pressure his illness has placed on his family is a source of great stress to him. We'd like to help Lachlan and his family during this tough time by providing financial support during his arm surgery and approximately seven months of chemotherapy as well as helping give him the tools he needs to write even while he can't use his right arm. We are able to provide anyone wanting proof of illness with the information they require to feel secure they are donating to a worthy cause. From Nick: Thank you everyone for your incredible generosity and support. It made a huge difference to Lachlan's family. 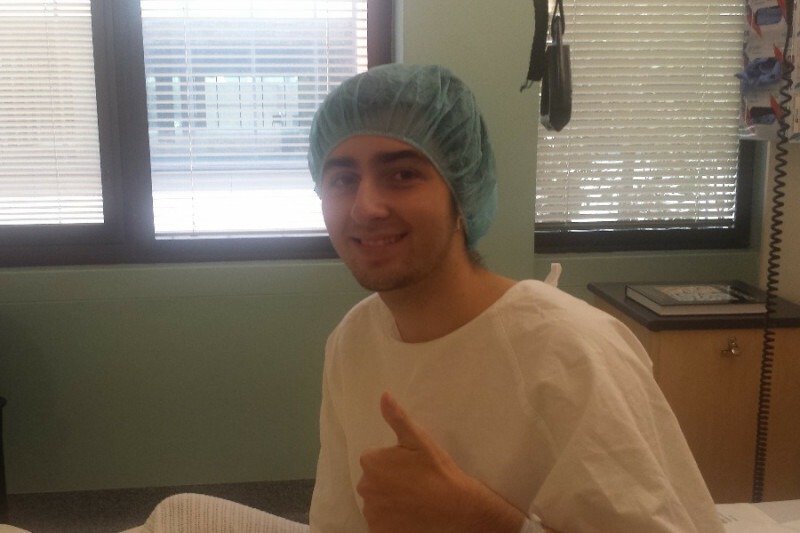 Just a quick note to all our generous donors; Lachlan has finished his chemo. We're waiting to see what post-chemo scans will reveal, but the family is very hopeful that the results will be positive and that the chemo has been successful. Donate at least $10 and receive 1 of the following free ebooks: Grim dark magazine (issues 1 to 4 only) or Seeds of Change, edited by John Joseph Adams. Donate at least $15 and receive 2 of the following free ebooks: Grim dark magazine (issues 1 to 4 only) or Seeds of Change, edited by John Joseph Adams. Donate at least $20 and receive 3 of the following free ebooks: Grim dark magazine (issues 1 to 4 only) or Seeds of Change, edited by John Joseph Adams. Donate at least $25 and receive 4 of the following free ebooks: Grim dark magazine (issues 1 to 4 only) or Seeds of Change, edited by John Joseph Adams. Donate at least $30 and receive the following free ebooks: Grim dark magazine issues 1 to 4 and Seeds of Change, edited by John Joseph Adams. Thanks so much for the updates. Good luck with the chemo. Sorry you have to go through this! Wishing you all the best for this fight Lachlan!